Brand: Dr. Ph. Martin's | Manufacturer: Salis International, Inc.
Dr. Ph. Martin's Bombay India inks offer powerful color in a convenient dropper-stopper glass bottle. These highly pigmented India inks not only remain lightfast and permanent, but are also totally waterproof when dry. They adhere to nearly all surfaces and are non-clogging when used in pens. Inks can be diluted with water and used with brushes in traditional watercolor techniques or in dip pens, technical drawing pens, and airbrushes. One of 24 different colors in 1.0 oz. (30 ml) glass bottles with droppers. RANGER-Tim Holtz Adirondack Alcohol Inks. These Dye based; multi-surface inks are acid free; permanent; quick drying and transparent. Creates a vibrant; polished effect on non-porous surfaces such as glossy paper; dominoes; metal; foil; shrink plastic; glass and others. Formulated to create a vibrant; polished stone look. Package contains three 1/2fl ounces/ 14.78 ml plastic bottles. Conforms to ASTM D 4236. Warning: Contents flammable. A precision tip is included for each bottle. Made in USA. The 4 oz bottle of Blanco Blanco Pinata Alcohol Ink by Jacquard produces beautiful, color-saturated and acid-free results. 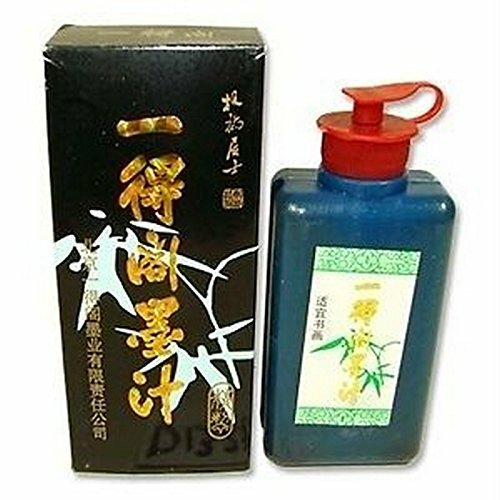 The alcohol base makes the ink permanent as well as moisture-resistant once completely dried. This professional product is versatile and can be used for rubber stamping, scrapbooking, calligraphy, airbrushing and staining. Applies easily to most clean, oil-free surfaces. Made in the USA. Keep out of reach of children. The Speedball Super Black India Ink is a free flowing, non-clogging, dye free, ink that offers optimum lightfastness. Non-toxic, 100 percent carbon pigmented. Waterproof. Made in the USA. 1 Quart. Dr. Ph. 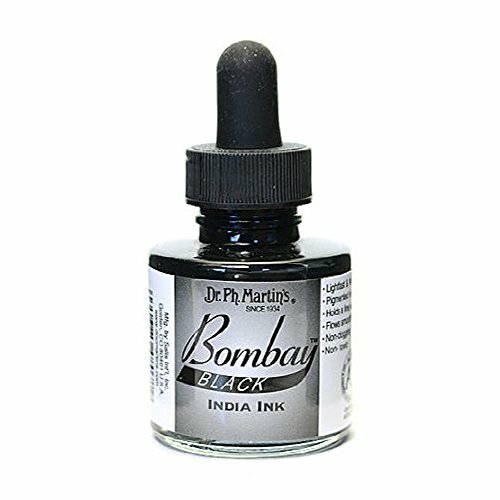 Martin's Bombay India inks offer powerful color in a convenient dropper-stopper glass bottle. These highly pigmented India inks not only remain lightfast and permanent, but are also totally waterproof when dry. They adhere to nearly all surfaces and are non-clogging when used in pens. Inks can be diluted with water and used with brushes in traditional watercolor techniques or in dip pens, technical drawing pens, and airbrushes. All colors are brilliant and transparent, except black and white, which are opaque and have excellent covering power. 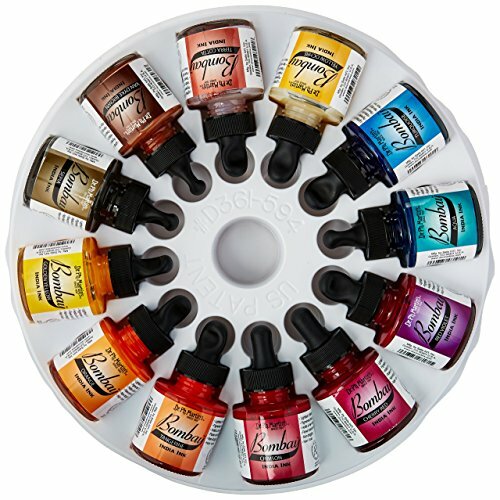 Each set includes 12 different colors in 1.0 oz (30 ml) glass bottles with droppers and a custom mixing palette. Set 1 Colors: Yellow, Red, Magenta, Green, Blue, Brown, Black, White, Violet, Bright Red, Teal, Grass Green. 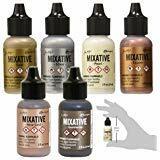 Bundle of six 1/2 fluid ounce bottles of Tim Holtz Ranger Metallic Mixatives. Colors include: Pearl and Copper, Gold and Silver, Rose Gold and Gunmetal. 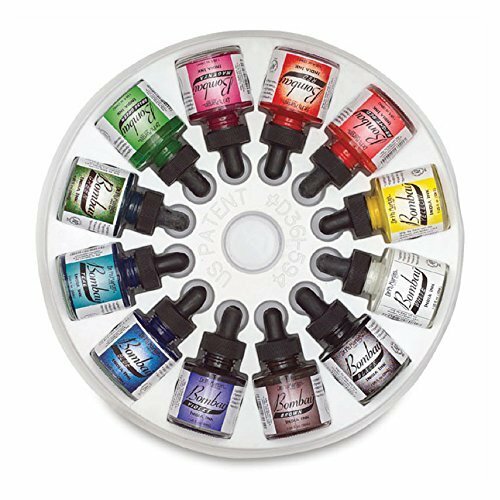 Luminous, versatile, fast drying, acid-free inks, specially formulated to create metallic highlights when combined with Adirondack Alcohol Inks (sold separately). Use them on all non-porous surfaces such as light or dark gloss paper, dominoes, Memory Glass, metal, foil, shrink plastic, and other slick surfaces. Tips and techniques are featured on package. Bundle of six 0.5-fluid ounce bottles of Tim Holtz Ranger Metallic Mixatives. Colors include Silver, Gold, Rose Gold, Gunmetal, Pearl and Copper. 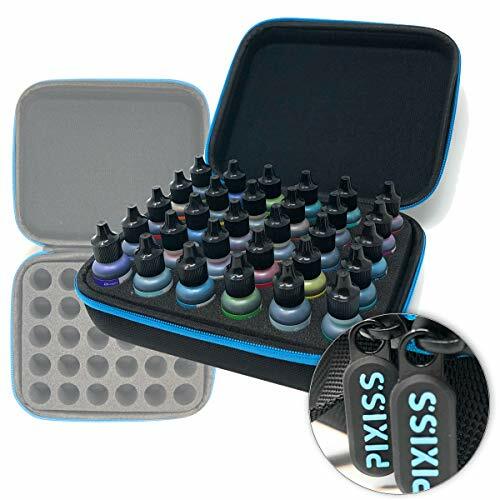 The Pixiss alcohol ink storage case is perfect for storing and carrying up to 30 bottles of Ranger or Jacquard alcohol inks, Stickles, Glossy Accents or Reinkers (ink bottles not included). 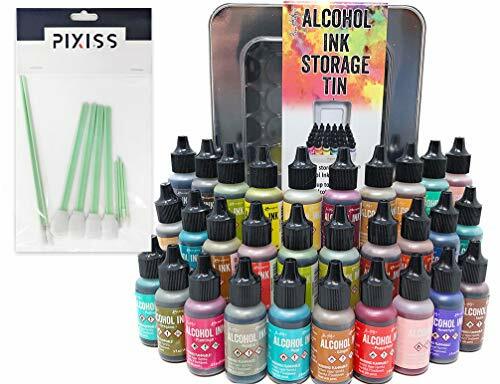 30 BOTTLES - The Pixiss Alcohol Ink Storage Case stores 30 bottles of Ranger or Jacquard 0.5oz alcohol inks, Stickles, Glossy Accents or Reinkers (ink bottles not included). ORGANIZE- Effortlessly organize your alcohol ink collection, while preventing the bottles from rolling around and protecting them from sunlight. This organizer holds up to 30 bottles of ink. READY TO TRAVEL: The water resistant shockproof hard shell makes the bag very sturdy, keeping the containers inside safe, while also being compact and lightweight. SIZE - 8.5 x 7 x 3 inches. 30x Tim Holtz Alcohol Ink .5oz Bottles (Random Colors) and Tim Holtz Alcohol Ink Storage Tin which stores all 30 ink bottles. Also included are 10 Pixiss ink blending tools consisting of 5 different sizes and shapes. STORAGE TIN - Tim Holtz Alcohol Ink Storage Tin - Holds All 30 Inks. The tim holtz alcohol ink storage tin is the ideal storage solution for alcohol ink bottle. It features a clear window and hinged metal closure. The custom tray keeps the alcohol inks in place for easy access. One storage tin measures 6.25x5. 875x3. 25. BLENDING TOOLS - 10x Pixiss Ink Blending Tools (5 different sizes and shapes). The foam tips are perfect for blending your inks on Yupo paper and more. 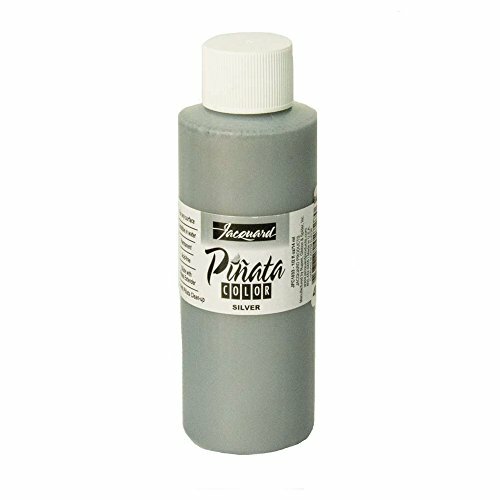 The 4 oz bottle of Silver Pinata Alcohol Ink by Jacquard produces beautiful, color-saturated and acid-free results. The alcohol base makes the ink permanent as well as moisture-resistant once completely dried. This professional product is versatile and can be used for rubber stamping, scrapbooking, calligraphy, airbrushing and staining. Applies easily to most clean, oil-free surfaces. Made in the USA. Keep out of reach of children. 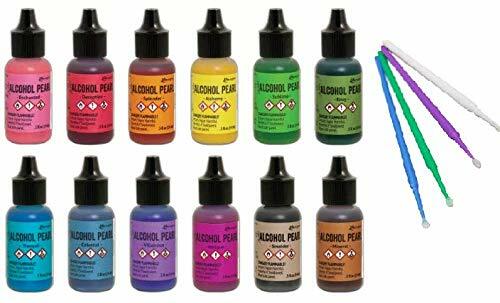 Ranger Tim Holtz Alcohol Pearls Complete Set Bundle (All 12 Colors), 2-Ounce Ranger Alcohol Ink Blending Solution 10x Pixiss Alcohol Ink Blending Tools For Blending Your Pearls On Yupo Paper and More. 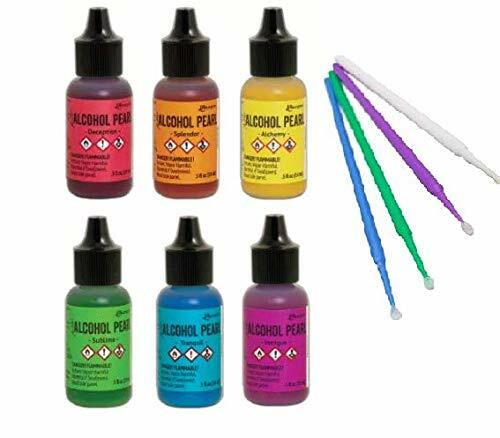 ALCOHOL PEARLS - Tim Holtz Alcohol Pearls are permanent, fast drying, pigment and dye inks formulated to create pearlescent colorful effects. 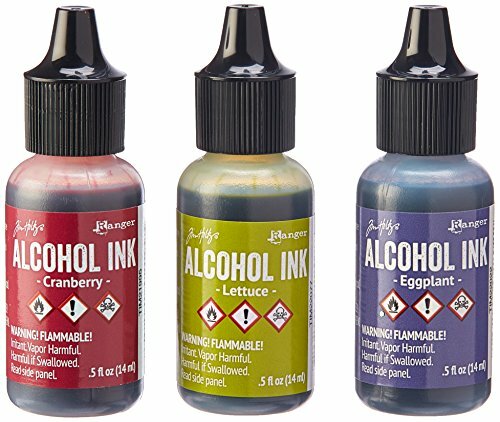 BLENDING SOLUTION - 2-Ounce Ranger Alcohol Ink Blending Solution. 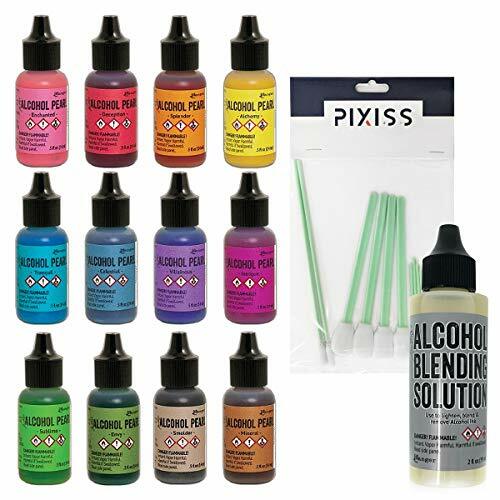 PIXISS BLENDING TOOLS - 10x Pixiss Ink Blending Tools (5 Different Sizes). The foam tips are perfect for blending your inks. USES - Achieve luminous layers on YUPO, Alcohol Ink Cardstock, Alcohol Ink Surfaces, and other non-porous surfaces. SIZE - 12x .5 oz Bottles. 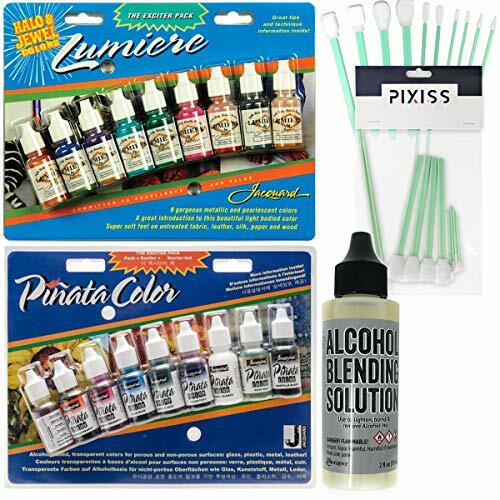 Jacquard Exciter Pack Bundle, Lumiere Exciter Pack .5oz 9/Pkg, Jacquard Pinata Color Exciter Pack Alcohol Ink, Ranger Alcohol Blending Solution, 10x Pixiss Blending Tools. PINATA EXCITER - Jacquard Pinata Exciter 9 pack alcohol inks. Great alcohol-based transparent inks. Includes 9x 1/2-ounce bottles of color. Works freely on just about any oil-free surface. Conforms to ASTM D4236.Great for glass, leather, wood, paper, plastic, metal, metal foil and vinyl. LUMIERE EXCITER - Jacquard Lumiere Exciter Pack .5oz 9/Pkg. Lumiere is a stunning metallic paint that can be applied with brush; airbrush; stamp; and sponge on a variety of surfaces including paper; polymer clay; cotton; leather; wood; and more. This package contains nine 0.5 ounce bottles of Lumiere (Halo Pink Gold; Halo Blue Gold; Halo Violet Gold; Pearlescent Turquoise; Pearlescent Green; Pearlescent Magenta; Russet; Pewter; Sunset Gold). Conforms to ASTM D4236. Tim Holtz Alcohol Pearls are permanent, fast drying, pigment and dye inks formulated to create pearlescent colorful effects. 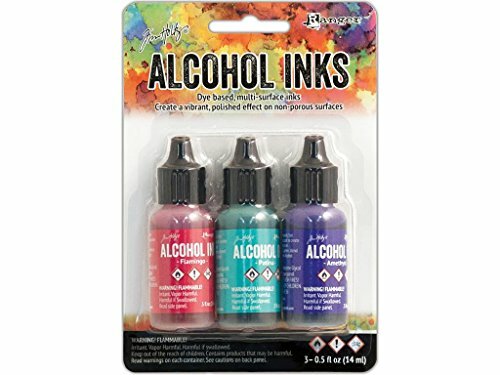 Use with Tim Holtz Alcohol Inks and Alcohol Ink Blending Solution to achieve luminous layers on YUPO, Alcohol Ink Cardstock, Alcohol Ink Surfaces, and other non-porous surfaces. Available in 12 colors open stock, each in a .5 fl. oz. bottle or four kits, each containing 3 colors. Achieve luminous layers on YUPO, Alcohol Ink Cardstock, Alcohol Ink Surfaces, and other non-porous surfaces. Tim Holtz Alcohol Pearls are permanent, fast drying, pigment and dye inks formulated to create pearlescent colorful effects. 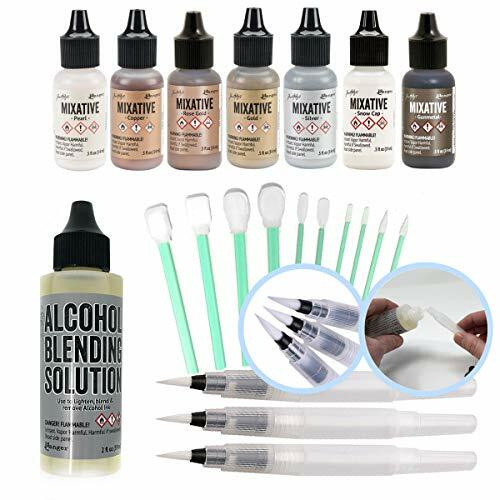 Use with Tim Holtz Alcohol Inks and Alcohol Ink Blending Solution to achieve luminous layers on YUPO, Alcohol Ink Cardstock, Alcohol Ink Surfaces, and other non-porous surfaces. Available in 12 colors open stock, each in a .5 fl. oz. bottle or four kits, each containing 3 colors. Includes Deception, Splendor, Alchemy, Sublime, Tranquil, Intrigue, Enchanted, Envy, Villainous, Celestial, Mineral, and Smolder. Size:1/2 Ounce JACQUARD-Pinata Color Exciter Pack. Pinata Colors are beautiful, color-saturated, acid-free, transparent inks. They are alcohol based making them indelible and moisture resistant when dry. They work freely on just about any oil-free surface. This package contains nine 0.5 ounce bottles of Pinata Color: Sunbright Yellow, Calabaza Orange, Senorita Magenta, Baja Blue, Rainforest Green, Passion Purple, Blanco Blanco, Mantilla Black, and Rich Gold. Conforms to ASTM D4236. Made in USA. Made from a safe and Eco-friendly cloth and ink that are non-toxic, safe, and high color rendering. The ink dry very fast, and after the ink is dry on paper, it is waterproof and non fading color. 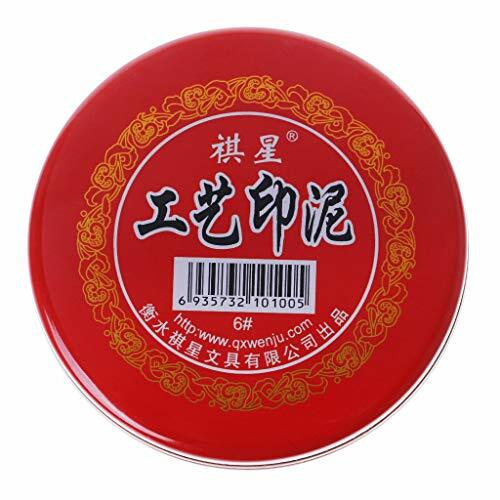 Bright red color is perfect for seal, fingerprint stamping, or Calligraphy art painting drawing. It also can be a safe educational graffiti tool for kids, bright color will attract kids and stimulate their sense of color. This red ink pad can let children use their imagination, creating a great finger painting. 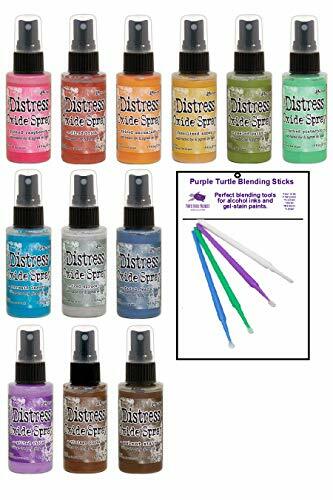 Ranger Tim Holtz Alcohol Ink Mixatives (All 7 Colors), 2-Ounce Ranger Blending Solution, 3 Pixiss Blending Brush Pens, 10 Pixiss Precision Ink Blending Tools. MIXATIVES - 0.5oz Ranger Tim Holtz Mixitives, Pearl, Copper, Silver, Gold, Snow Cap, Rose Gold, Gunmetal. PIXISS BLENDING TOOLS: 10x Pixiss Ink Blending Tools (5 Different Sizes). The foam tips are perfect for blending your inks. ACID FREE & NON TOXIC - dyes are a high quality, acid-free, non-toxic concentrated colorant for porous surfaces.